Barbie fans...get this Barbie Dreamtopia Rainbow Cove 7 Doll Gift Set for $19.87 (Retail $44.99) for Prime Day! 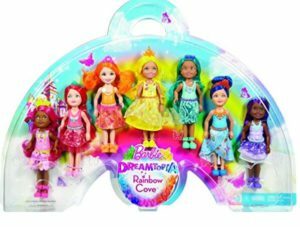 Enter the Rainbow Cove kingdom with this colorful pack of seven dolls! Each Chelsea doll represents a different color of the rainbow to complete a magical make-believe moment. Together, they are a band of color — each wears an adorable, brightly colored outfit and has vibrant matching hair in a unique hairstyle. Cute shoes and a fun hair accessory for each style complete the looks with matching or complementary colors.